A very special party took place at Neville Williams House on 6th February to celebrate Ruth Reece’s 100th birthday. 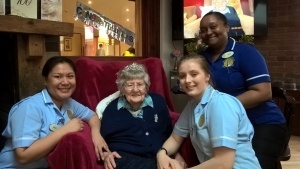 Ruth, who has been a resident for four years, was treated to her very own butler for the day and as part of the celebrations, enjoyed entertainment from a singer. The onsite pub was dressed for the occasion and Ruth’s family and friends enjoyed sharing food, drink and memories together. Her telegram from the Queen was framed and took centre stage in the room and photos of Ruth throughout her life appeared on the television screen. Originally from the East End of London, Ruth, known by her friends and family as Ruley, got her first job at the age of 14 in a shoe factory. During the Second World War aged just 19, she joined The Women’s Auxiliary Air Force (WAAF) and became a barrage balloon operator, taking great pride in the fact that it took nine women to the job formerly done by 14 men! By creative|2019-02-11T09:59:09+00:00February 11th, 2019|Latest News|Comments Off on Celebrating 100 years!